Four boys among 12 who were stuck in the flooded cave in Thailand's northern province of Chiang Rai were rescued on Monday, the Thai Navy SEAL said in a Facebook post. He was taken by helicopter and ambulance to the same hospital in Chiang Rai where the first four boys rescued Sunday by a team of worldwide and Thai dive experts are being treated. 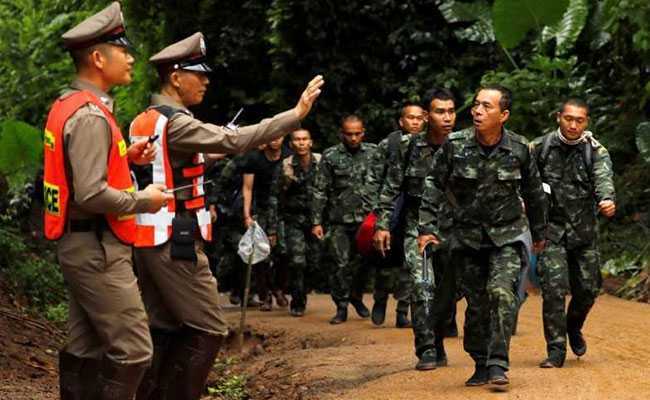 On June 23, a Thai soccer team (aged 11-16) and their coach became stranded in the Tham Luang underground caves they were exploring, when severe rains sealed off their escape route. Osottanakorn said the second rescue involved numerous same divers who brought the four boys out on Sunday. Authorities are racing to rescue the remaining eight boys and their 25-year-old coach before monsoon rains cause the floodwater to rise. "Everything is all good - weather, water and the boys' conditions", he said, adding, "We will speed up [the operation]". The only way to bring the boys and their coach out of the cave is by navigating dark and tight passageways filled with muddy water and strong currents, as well as oxygen-depleted air. Medical staff involved in the rescue mission say their first assessments when the boys arrive at the hospital will focus on their breathing, signs of hypothermia and an airborne lung infection known as "cave disease". "The operation went much better than expected, " Chiang Rai acting Gov. Narongsak Osatanakorn, who is overseeing the mission, said Sunday night. But he added rescuers may need more than 20 hours, to replan and replenish oxygen supplies, to be ready to mount the next mission. All but the last of the boys rescued today have reached the top provincial hospital 60 kilometers away. One of the biggest concerns in the rescue operation is an area of the cave that is just 15 inches across so the boys have to separate from the divers in order to fit through. Among those are U.S. military partners, British cave diving experts - including the two men who first located the boys a week ago - and rescue workers from Australia, China and other countries. The 12 boys and their coach were trapped in the cave for two weeks. The hordes of global and local media have been kept back from the cave and the hospital in Chiang Rai, where the rescued boys are believed to be under observation.